Here's the ultimate capitalist car. 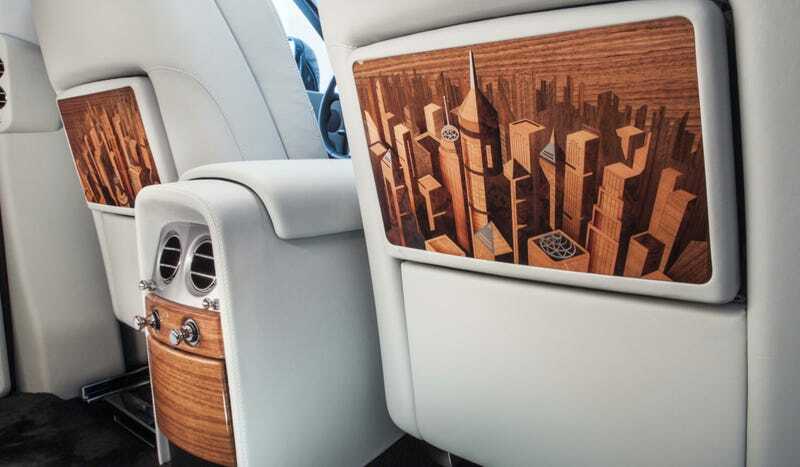 Capitalist, as in somebody who lives in a capital (financial, cultural, political), because the Rolls-Royce Phantom Metropolitan Collection is all about the celebration of large cities around the world with images of skyscrapers cut into wood and leather. Rolls-Royce likes to build their own bespoke series cars because collectors fork these up in an instant and the limited editions also provide a great opportunity for them to show the world what the craftsmen at the Goodwood factory can do with wood, metal and leather. When it comes to wood, I guess the Pinnacle Travel took the cake, but the Metropolitan is also stunning with its Darkest Tungsten exterior, special coach line, Walnut veneer and Metropolitan marquetry/embroidery depicting the city from above on your folding table. And for a base price of 450,075 Euros without tax, you also get a fancy clock. My pictures don't do it justice, but those 25 individuals who can by this will certainly be satisfied with the quality of this V12-powered cigar room.